Delray Beach, FL—Three times this week I’ve been afforded the luxury of a stroll outside, to bask in the golden rays that make our Delray Beach so special, to relish a glimpse of the National-caliber tennis action bustling just outside the walls I call the very same matches from. Three times I’ve been forced to make a double-take upon seeing a stroke, a shot, a player doing something uniquely different than the rest. Three times it’s been Bennett Dunn. And, it’s the only time I’ve seen her. She’s not a tournament desk hanger-outer. She doesn’t seem to run in any particular entourage. I’ve never had the chance to sit and speak with her. She just comes to ‘Nats,’ plays a progressive game, wins and disappears. Pretty simple, maybe the way she likes it. So I can only share with you my impression of Dunn by the glimpses of her shot making, my admiration of her achievement and a hope to see her continue to do well this week. 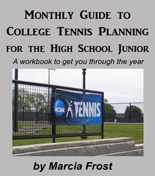 Through five matches, the Plantation, Florida player has lost only one set. In all sets but the one she lost, she has never given up more than three games. She has played three seeds -- #13, Ingrid Neel (Rochester, MN), 6-0,6-1, see ya; #2, Andie Daniell (Douglasville, GA), 2-6, so what, 6-1,6-3, better luck next time; #17, Sophia Kenin (Pembroke Pines, FL), 6-2,6-1, have fun in consolation. As an unseeded player, Dunn doesn’t possess the fear-inspiring resume that usually wins star players a few games before even picking heads or tails. Rather, her approach is more like a blindsided left hook that staggers, stumbles and drops her opponents without the need for even an 8-count. For your accomplishments, poise and stealth-like maneuvers, we gladly acknowledge you as today’s Girls’ Player of the Day. Furthering Florida’s advancement through the girls’ draw, three other Sunshine state maidens joined Dunn in the semifinals with impressive wins: #6, Anastasia Nefedova (Palm Harbor, FL) defeated #4, Nicole Frenkel (Winchester, MA), 6-2,6-1; Tornado Ali Black (Boca Raton, FL) defeated #3, Rianna Valdes (Tampa, FL), 7-5,6-1; #1, Julia O'Loughlin (Boca Raton, FL) over #7, Kenadi Hance (Torrance, CA), by walkover/injury. As the boys battled in Boca Raton, it was the standout demeanor of Walter Brittain (Bigfork, MT) that caused the site director and tournament officials to recognize him as the Boys’ Player of the Day. Don't miss this rare, exciting and FREE opportunity to see tomorrow's stars that will carry the tennis torch when passed on from Andy, James, Serena and Venus, all players who have taken the USTA National road to their success. 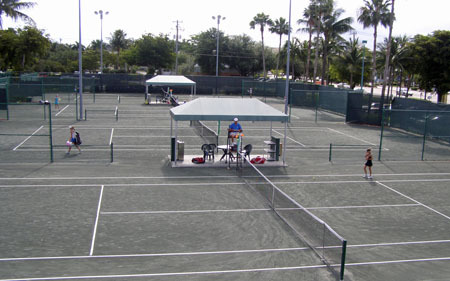 All Semifinal and Championship matches (boys and girls) will be played at the Delray Beach Stadium & Tennis Center (201 W. Atlantic Ave., Delray Beach, FL, 33444, 561 243 7360) on Friday, April 17 and Saturday, April 18. Also stay tuned to Fox Sports Florida as a 1-hour program featuring highlights of the Boys' and Girls' Singles Championships will be televised statewide in May.